One of our first group meals on our Adventures by Disney trip in San Francisco was at M.Y. China. When they told us this restaurant was in the Westfield Mall, I instantly thought foodcourt. I couldn’t have been more wrong! This is a fairly elegant restaurant on one of the upper floors of the Westfield on Market St. We were seated in the back area near the wall of Buddah statues. As we sat, in front of us was the menu of the dishes we were to be served – “family style” – as my American friends call it. Basically a bunch of dishes that you pass around the table. Hmmmm, Sichuan Green Beans might be vegetarian, but the rest, I don’t think so! Never fear, our Adventure guides quickly told the staff that we were vegetarian… “no problem” we were told and we waited. As the other dishes started piling onto the table, we watched as our tour mates tucked into piles of delicious looking, animal laden, food. This was a great example of good things taking time. It was quite some time before our specially prepared food started to arrive. But we were then tucking into some of the most amazing food I have ever had. And I mean ever! I am not sure if it was due to the fact it was a late lunch or that we had been biking along the waterfront of San Francisco in the morning, or whether the food really was just that spectacular, but this food was vacuumed up at high-speed and in vast quantities. 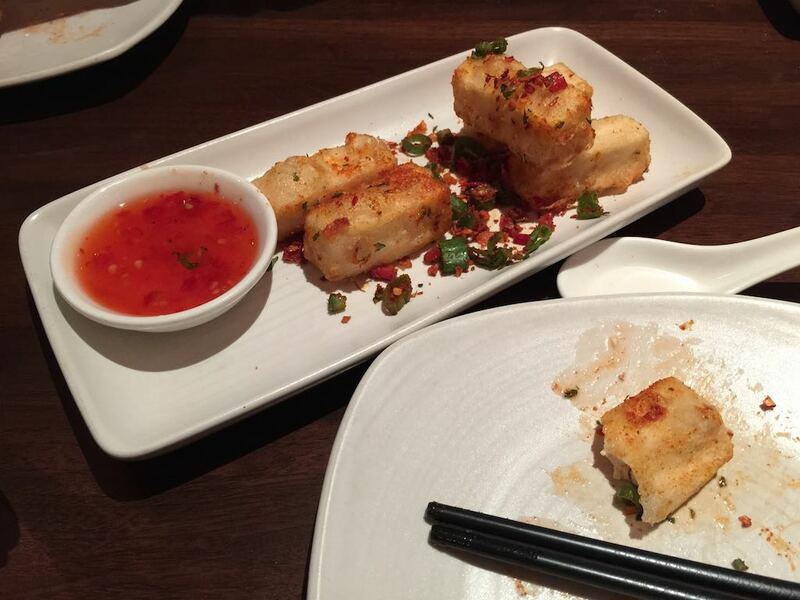 The first dish to arrive was this fried tofu with sweet and sour sauce. The tofu was seasoned in very spicy chilli, flavoured seasoning. If you don’t like spicy food maybe skip this one, but I loved it. The tofu was crispy on the outside and soft and creamy inside. OMG, yum! I could have eaten plates of it! The next dish that arrived was this salad. The waitress said it was her personal favourite and I could see why. 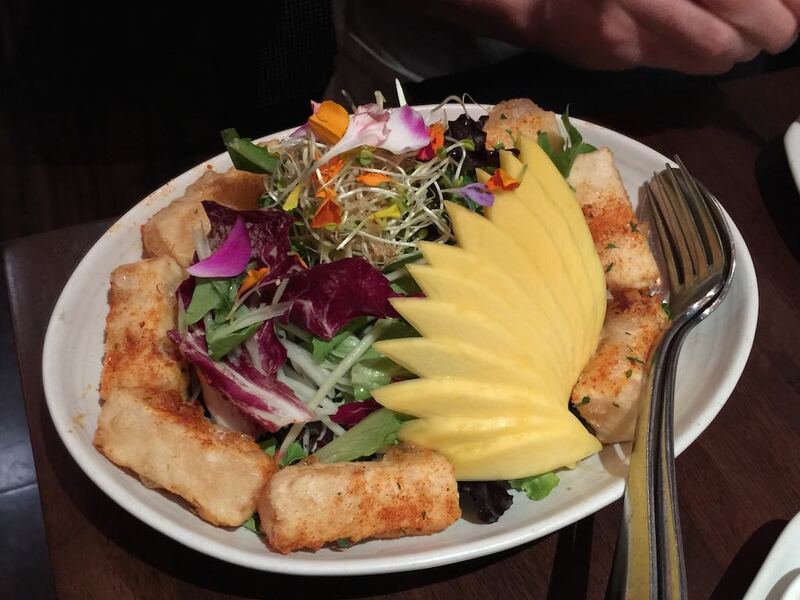 The same tofu as above, with an array of salad greens and fresh mango. This was huge and could serve as a light meal for one. I could also see why she recommended it. Not a whisper of this went back to the kitchen! The next dish I was pretty sure served partially for entertainment value for other diners. Just trying to pickup one of these jellyfish like substances with chopsticks was impossible. I’m no stranger to chopsticks, I’ll happily eat with them, but these had me beat! 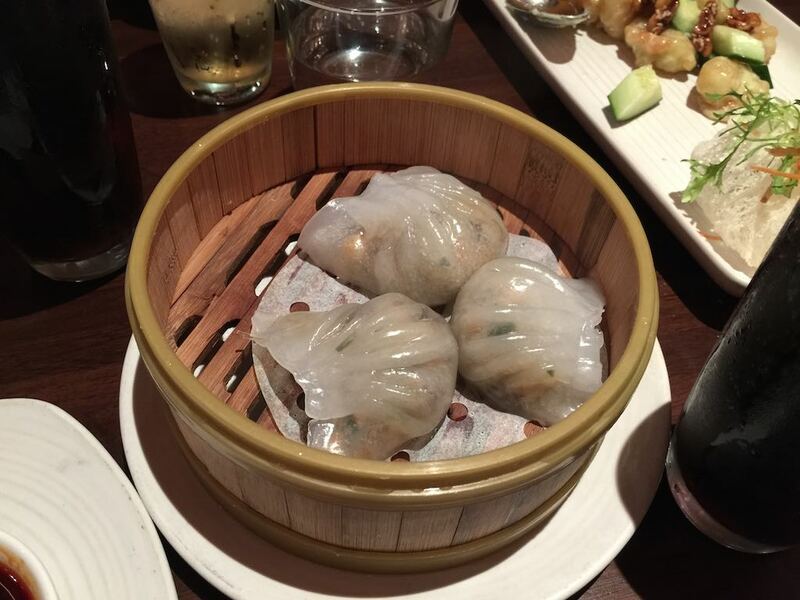 These little parcels contained impossibly thinly sliced vegetables and chinese mushrooms. Served with soy sauce… They looked bland but were little parcels of pure flavour! 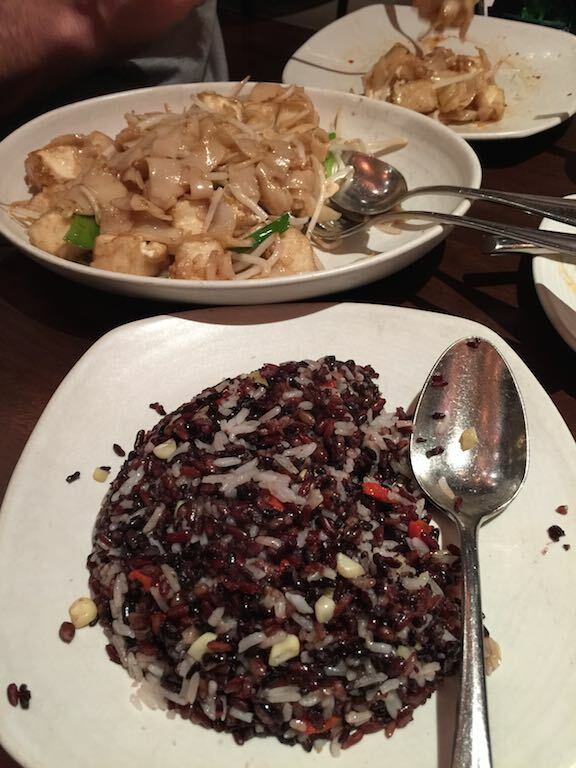 This came to the table almost at the same time as this wild rice dish which had a toasted nutty taste. I think I might have groaned in ecstasy on the first mouthful. Along the way, also came the Sichuan Green Beans… spicy, beany goodness! And lastly dessert. Thank goodness it wasn’t huge. I was already expecting to have to be rolled out the building. 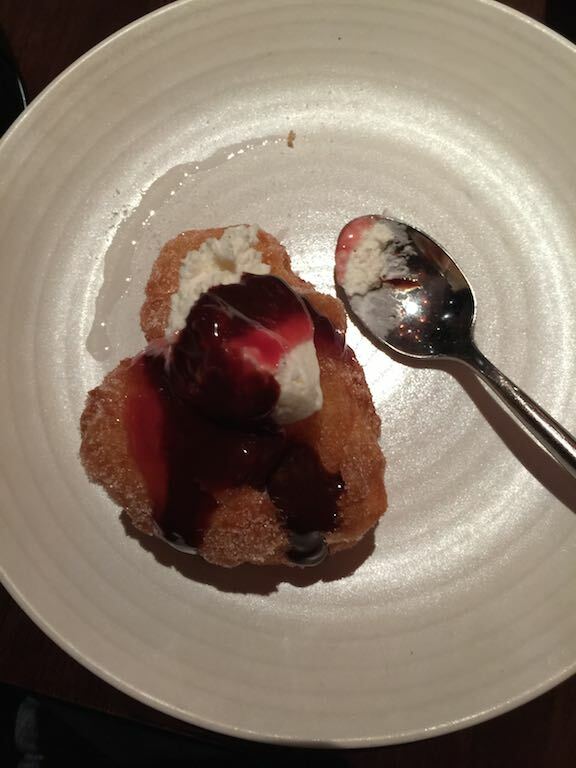 Dessert looked like a donut but was an as light-as-air puff of sugary-cinnamony nothing that collapsed into a flavour explosion in your mouth – with 3 dipping sauces – chocolate, berry and cream. 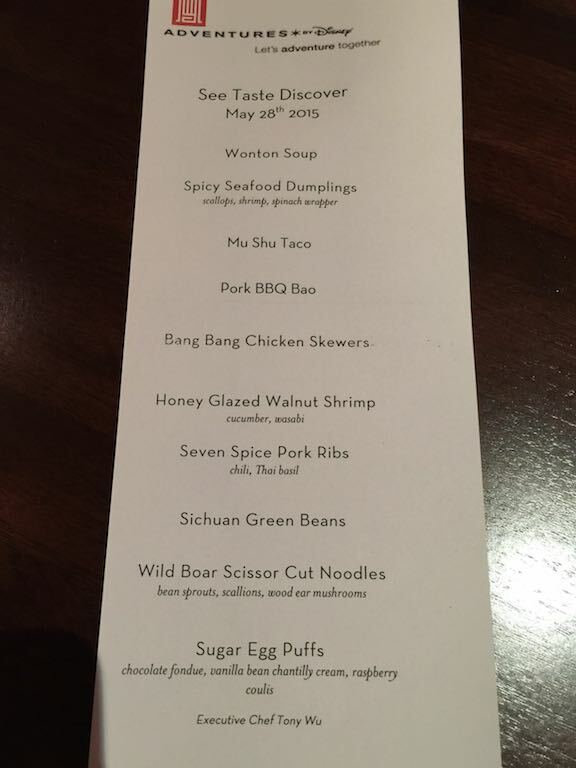 So if you are in the area, and vegetarian, don’t let the limited vegetarian menu items put you off. This was an amazing meal! The best we had the entire trip. « Wordless Wednesday – I’m not sure what that means ? This looks fabulous! And relatively close to my area! Definitely check it out and let me know what you thought!